Irene, with her hurricane shrieks and rainfilled attacks on the skyscrapers, turned New York into a city full of walls. The city centre shops protected themselves with sandbags. Offices in Manhattan defended themselves by sticking insulation tape across their windows. Police barricades were mounted on street corners... Meanwhile, the US Open organizers crossed their fingers that the tournament would be able to begin today. The organizers are hopeful the tournament can get under way today in spite of hurricane Irene. Rafael Nadal, who is to play his first match against Andrey Golubev 'Kazakh'. He also is thinking of defense & walls. He hasn't arrived in New York with so few summer hardcourt match wins,only two this summer since 2004. With a burn on his right hand and his left heel pain, the Spaniard lacked speed in Montreal and Cincinnati, where he had a hard time trying to recover position on court. What has he been doing to try to recover the mobility for which is his major label? 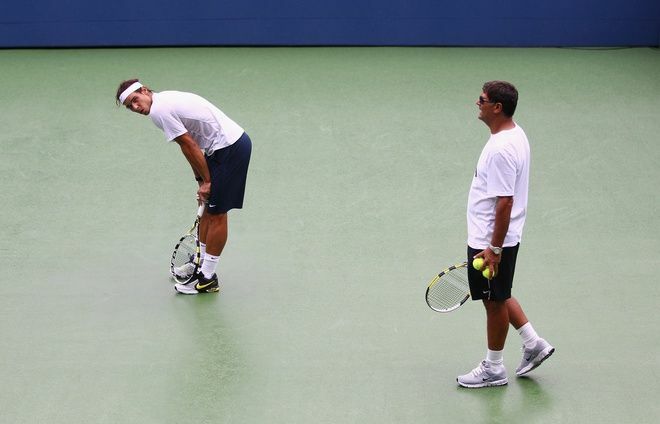 "We've been working on his legs by prolonging the work done on court in the gymnasium, it's very intensive training, which is already always the case with Rafa," explained Rafael Maymo, the champion's physiotherapist and the one who carries out the plans designed by Joan Forcades, the world number two's physical preparer. "He has done a lot of stationary bicycle work, at a constant rhythm, not too fast, at cruise speed, and for a period of time that has gradually been reduced as the competition approaches," he went on. "This has been the resistance work. The explosiveness has been worked on with comba exercises because the jumps give that spark that's needed. We've also put ladders down on the court so he can do agility exercises and RSA (repeated-sprint ability) exercises with an objective: every repetition ends with hitting the ball, and getting it to land in court. We do 10 seconds at maximum speed followed by 10 seconds rest... and then begin again. It's repeating and repeating. It's imitating what's done in a match. In short, it's tennis," he stressed. Nadal, who will probably play his first match tomorrow, Tuesday, was on the point of withdrawing from the Montreal tournament, his first commitment after losing to Djokovic in the Wimbledon final. The foot he had injured in London was hurting him. He had had three weeks of vacation, prevented from practising by the pain. He had been seen on the beach with a bandage protecting his ankle. He hadn't managed more than four "decent" practice sessions with his racquet, "practically nothing". He started the North American tour with preparation done on stationary and elliptical bicycles and with Forcades' exercises, focussed on protecting his joints and on working his abdominal muscles, his trunk and his arms (upper extremities). "We were looking for a bit more tone and we did work focussed on gaining speed, resistance and capacity to repeat sprints," his team explained. It wasn't enough: on his debut on this tour, in Montreal, Nadal ceded a match to the Croat Dodig that he had been leading 6-1 3-1. This undermined his confidence and left him without the number of matches he needed to play. Forced into a spartan regime of training before the US Open, he faced up to the challenge of rebuilding his defensive capacity and speeding up his motor... "He's like a diesel engine," his team added. "When he starts to win, he's very difficult to beat, but ... "
"I'm making great steps forward," Nadal, who completed his set of four Grand Slam titles in New York in 2010, "I'm practising much better. I would have liked to have played at least one more match before the tournament, but it was not to be. The time I spent without practising was much longer than we would have liked. Maybe that's positive. Bad for Montreal and Cincinnati and good for getting here with my mind fresh. Time will tell." Irene opens her mouth and propels powerful roar.. Nadal shows his teeth and fiercely clenches them. Yesterday, in Montreal and Cincinnati, he was but a puff of wind. Today, in New York, he wants to get back to being a raging cyclone of furious tennis once again.